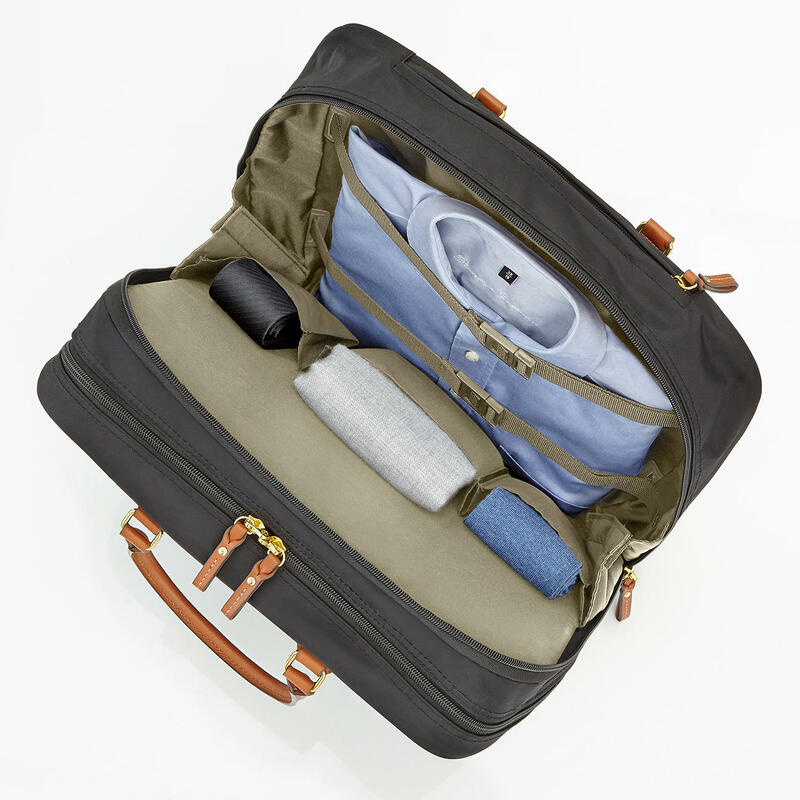 Two independently accessible main compartments separate clothing from business documents. Particularly orderly and clearly arranged. Hard-wearing. Water repellent. Resilient to dirt. 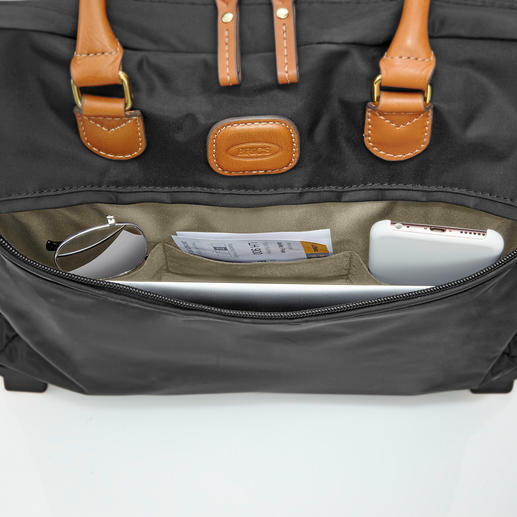 Chic business bag from Bric`s, Italian specialists in fine travel luggage since 1952. This business bag has the look of a handbag and – if needed – becomes a practical trolley in an instant. Its secret: The separate zipped compartment features a telescopic handle and on the underside of the bag you will find two unobtrusive wheels. This makes it a perfect business bag for heavy files and an ideal travel companion on business trips. Unlike conventional trolleys, you have easier access to your business documents – without the hassle of having to empty half the trolley. Tensioning straps secure the contents. A padded compartment with rip-tape protects your tablet or laptop (up to 34 x 23 x 2cm (13.4" x 9.1" x 0.8")). 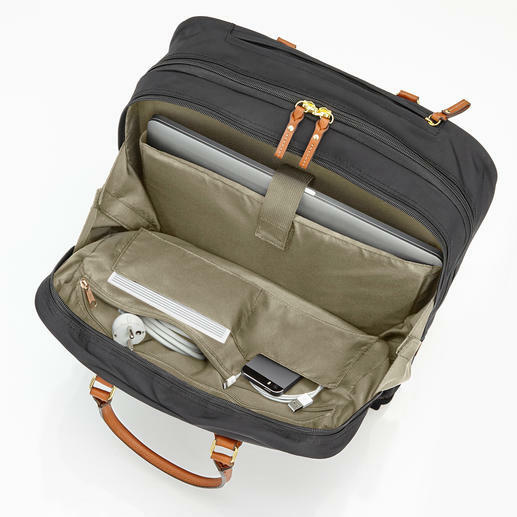 The bag features a total of 5 slide-in compartments and a zipped compartment for smartphone, charging cables, pens, business cards etc. A large zipped compartment on the outside with 3 additional slots provides quick access to smartphone, glasses, tickets, travel information etc. Made of sturdy black woven nylon with leather details on vegetable-tanned Tuscan cowhide. Easy to wipe clean with a damp cloth. Telescopic handle made of aluminium, extendable to 63cm (24.8"). Reinforced base plate with smoothly running wheels and plastic feet. Buttoned leather handles. Holds 20 litres. Measures 40 x 35 x 15cm (15.7" x 13.8" x 5.9") (W x H x D). Weight 2.24kg (4.9 lbs).Chic business bag from Bric`s, Italian specialists in fine travel luggage since 1952.